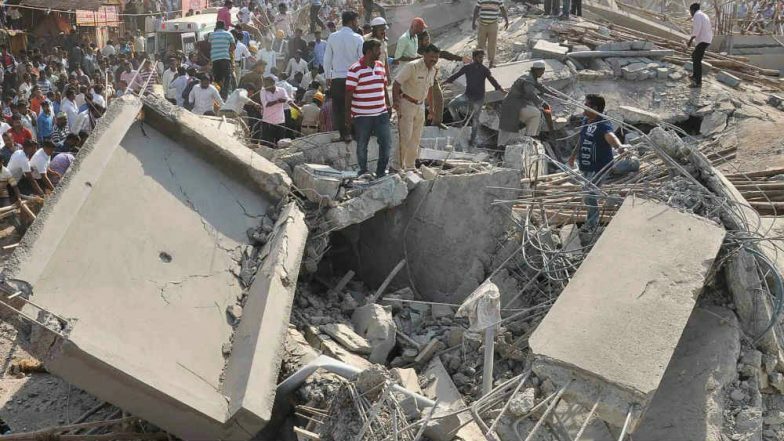 Bengaluru, March 20: The death toll in the building collapse at Dharwad in north Karnataka rose to five on Wednesday, DG of Police in Karnataka State and Chief of Fire and Emergency Services, MN Reddi said. While some people were still suspected to be trapped under tonnes of cement and mortar, 55 were rescued by authorities. The multi-storey commercial under-construction building in Dharwad's Kumareshwar Nagar came down crashing at around 3.50 pm on Tuesday. Most of those trapped were migrant labourers from north India who were engaged in laying tiles. In addition to 10 ambulances and five fire tenders deployed for relief and rescue operations, three teams of the National Disaster Relief Force (NDRF) have been pressed into service, two from Ghaziabad and one from Bengaluru. About 150 police, fire and emergency personnel too have joined the rescue operations. Karnataka Chief Minister HD Kumaraswamy said rescue efforts will be conducted on a war footing and urged the local people to not panic. "The rescue work is on a war footing. About 25 people have been rescued and three persons are seriously injured. The injured are being treated. I request the local public not to panic and all those feared trapped in the building will be rescued ASAP," the CM posted on his official twitter handle. State unit Congress leader Vinay Kulkarni's kin was one of the owners of the building which was under construction. The cause of the collapse was not known. No case has been registered or arrest made so far. The reason for the accident was being ascertained, officials told news agency IANS.